Warning: Game of Thrones spoilers ahead. Proceed with caution! 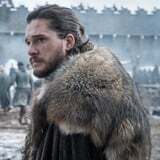 Why Did Jon Snow Leave Winterfell - and What Does His Return Mean? With the Night King heading toward Winterfell, it's important for the Northern houses to stand united. Although Daenerys's army is vast, it's not enough to stave off the dead. She and Jon need as many allies as they can get, and since the Karstarks are an influential Northern House, it's vital that they have them on their side. The Unsullied and Dothraki are skilled warriors, but they don't know the North, and they have no sway there.